A transistor based on the 2-dimensional material tungsten ditelluride (WTe2) sandwiched between boron nitride can switch between two different electronic states — one that conducts current only along its edges, making it a topological insulator, and one that conducts current with no resistance, making it a superconductor. Researchers at MIT and colleagues from four other institutions have demonstrated. The new findings have been published online in the journal Science. Valla Fatemi PhD ’18, who is now a postdoc at Yale, and postdoc Sanfeng Wu, who is a Pappalardo Fellow at MIT, are co-first authors of the paper with senior author Jarillo-Herrero. The co-authors are MIT graduate student Yuan Cao; former postdoc Landry Bretheau of the École Polytechnique in France; Quinn D. Gibson of the University of Liverpool in the UK; Kenji Watanabe and Takashi Taniguchi of the National Institute for Materials Science in Japan; and Robert J. Cava, a professor of chemistry at Princeton University. Using four-probe measurements, a common quantum electronic transport technique to measure the electronic behavior of materials, the researchers plotted the current carrying capacity and resistance characteristics of the two-dimensional tungsten ditelluride transistor and confirmed their findings across a range of applied voltages and external magnetic fields at extremely low temperatures. "This is the first time that the exact same material can be tuned either to a topological insulator or to a superconductor," says Pablo Jarillo-Herrero, the Cecil and Ida Green Professor of Physics at MIT. "We can do this by regular electric field effect using regular, standard dielectrics, so basically the same type of technology you use in standard semiconductor electronics." MIT researchers Sanfeng Wu, left, a postdoc at MIT, and Pablo Jarillo-Herrero, the Cecil and Ida Green Professor of Physics, have demonstrated for the first time in a single material the controllable appearance of two different states of matter - topological insulator and superconductor. Their experiments used two-dimensional tungsten ditelluride. Photo: Denis Paiste/Materials Research Laboratory. "This is the first of a new class of materials — topological insulators that can be tuned electrically into superconductors — which opens many possibilities which before there were significant obstacles to realize," Jarillo-Herrero says. "Having one material where you can do this seamlessly within the same material to transition between this topological insulator and superconductor is something which is potentially very attractive." Tungsten ditelluride, which is one of the transition metal dichalcogenide materials, is classified as a semimetal and conducts electricity like metals in bulk form. The new findings detail that in a single-layer crystal form, at temperatures from less than 1 kelvin to liquid nitrogen range (-320.4 degrees Fahrenheit), tungsten ditelluride hosts three distinct phases: topologically insulating, superconducting, and metallic. An applied voltage drives the transition between these phases, which vary with temperature and electron concentration. In superconducting materials, electrons flow without resistance generating no heat. The new work builds on a report earlier this year by the researchers demonstrating the quantum spin Hall effect (QSH), which is the signature physics phenomenon underlying two-dimensional topological insulators, in the same single layer tungsten ditelluride material. This edge current is governed by the spin of the electrons rather than by their charge, and electrons of opposite spin move in opposite directions. This topological property is always present in the material at cold temperatures. This quantum spin Hall effect persisted up to a temperature of about 100 kelvins (-279.67 degrees F). "So it's the highest temperature 2-D topological insulator so far," says postdoc Sanfeng Wu, who also was a first author of the earlier paper. "It's very important for an interesting quantum state like this to survive at high temperatures for use for applications." This behavior, in which the edges of tungsten ditelluride material act like a quantum wire, was predicted in 2014 in a theoretical paper by associate professor of physics Liang Fu and Ju Li, a professor of nuclear science and engineering and materials science and engineering. Materials with these qualities are sought for spintronic and quantum computing devices. Although the topological insulating phenomenon was observed at up to 100 kelvins, the superconducting behavior in the new work occurred at a much lower temperature of about 1K. This material has the advantage of entering the superconducting state with one of the lowest densities of electrons for any 2-D superconductor. "That means that that small carrier density that is needed to make it a superconductor is one that you can induce with normal dielectrics, with regular dielectrics, and using a small electric field," Jarillo-Herrero explains. 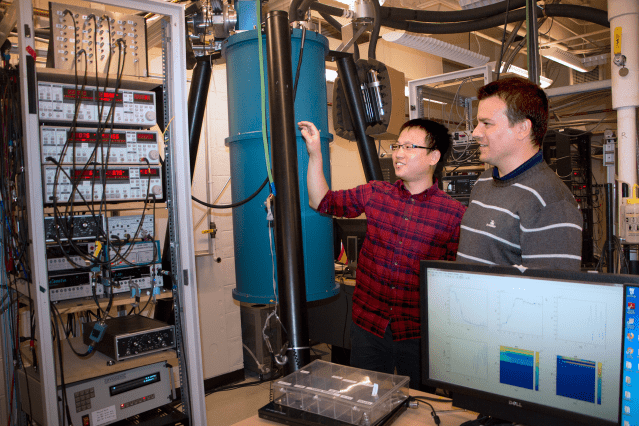 Addressing the findings of topological insulating behavior in 2-D tungsten telluride in the first paper, and the findings of superconductivity in the second, Wu says, "These are twin papers, each of them is beautiful and put together their combination can be very powerful." Wu suggests that the findings point the way for investigation of 2-D topological materials and could lead the way to a new material basis for topological quantum computers. The tungsten ditelluride crystals were grown at Princeton University, while the boron nitride crystals were grown at the National Institute for Materials Science in Japan. The MIT team built the experimental devices, carried out the electronic transport measurements at ultra-cold temperatures, and analyzed the data at the Institute. "It was done independently in both groups, but we both made the same discovery," Jarillo-Herrero says. "It's the best thing that can happen that your big discovery immediately gets reproduced. It gives extra confidence to the community that this is something that's very real." Jarillo-Herrero was elected as a fellow of the American Physical Society earlier this year based on his seminal contributions to quantum electronic transport and optoelectronics in two-dimensional materials and devices. A particular area where this new capability may be useful is the realization of Majorana modes at the interface of topologically insulating and superconducting materials. First predicted by physicists in 1937, Majorana fermions can be thought of as electrons split into two parts, each of which behaves as an independent particle. These fermions have yet to be found as elementary particles in nature but can emerge in certain superconducting materials near absolute zero temperature. "It is interesting by itself from a fundamental physics point of view, and in addition, it has prospects to be of interest for topological quantum computing, which is a special type of quantum computing," Jarillo-Herrero says. The uniqueness of Majorana modes lies in their exotic behavior when one swaps their positions, an operation that physicists call "braiding" because the time dependent traces of these swapping particles look like a braid. The braiding operations can't change the quantum states of regular particles like electrons or photons, however braiding Majorana particles changes their quantum state completely. This unusual property, dubbed "non-Abelian statistics," is the key to realizing topological quantum computers. A magnetic gap is also needed for pinning the Majorana mode at a location. "This work is quite beautiful," says Jason Alicea, professor of theoretical physics at Caltech, who was not involved in this research. "The basic ingredients necessary for engineering Majorana modes — superconductivity and gapping of edge states by magnetism — have now been separately demonstrated in WTe2." "Moreover, the observation of intrinsic superconductivity by gating is potentially a major boon for advanced applications of Majorana modes, e.g., braiding to demonstrate non-Abelian statistics. To this end, one can envision designing complex, dynamically tunable networks of superconducting quantum-spin-Hall edge states by electrostatic means." Alicea says. "The possibilities are very exciting." The work was supported by the Gordon and Betty Moore Foundation and also was partly supported by the U.S. Department of Energy Basic Energy Sciences Office, the National Science Foundation, and the Elemental Strategy Initiative in Japan.